We have been blessed with wonderful new books this fungi season and this 2nd revised and updated edition of Where the slime mould creeps by Sarah Lloyd is the latest. Order your copy from the Fungimap Shop here. 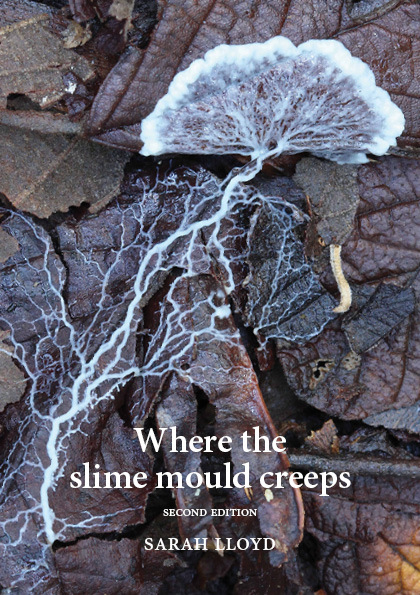 ‘Where the slime mould creeps’ introduces the fascinating world of myxomycetes, the plasmodial or acellular slime moulds. It describes their life cycle, the different types of plasmodia and fruiting bodies, and includes numerous of photographs that illustrate this important but little-known subject. This second edition includes updated information based on the latest research from around the world; additional personal accounts of slime mould ‘hotspots’; and the species list for Black Sugarloaf – and Australia – has been updated. Also included are some of Thomas McBride’s poetic descriptions from his 1899 book The North American Slime-Moulds; and thoughts about the function of iridescence in these ‘biological jewels of nature’. The number of species depicted in this edition has increased to 107 and almost all the photographs in the first edition have been replaced with images using focus stacking. Also included are more time-lapse series to show the remarkable changes the plasmodia undergo as they form fruiting bodies, micrographs that capture the ornate microscopic features found within their spore mass, and Scanning Electron Micrographs that show features not revealed by conventional microscopes. This book is packed with information intended for the general reader. Its numerous photographs and clear descriptions of key features should enable identification to family or genus for anyone lucky enough to find a slime mould.